Many years ago I read a book called The Lazlo Letters by comedian Don Novello. He was perhaps best known for his character Father Guido Sarducci on Saturday Night Live, a show I stopped watching sometime during the Charles Rocket era. Lazlo Letters was a collection of correspondence sent from Novello’s alter-ego Lazlo Toth, a well-meaning hyper-patriot full of great ideas. Toth sent letters to a variety of celebrities, executives and politicians of the day. The letters ranged in absurdity of content, but many still got results in the form of personal responses from folks like Nixon, Ford and CEOs of major US corporations. 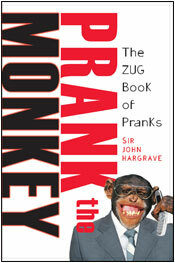 Author John Hargrave (zug.com) takes the mischief one step further with Prank the Monkey , going beyond funny letters and into elaborate, time-consuming operations. If this is his full-time line of work, it’s a pretty sweet gig. He tries lots of things I’ve tried myself: signing credit card slips with absurd names to see if anyone notices, voicing angry sentiment on checks and giving spammers a dose of their own medicine. But he tries plenty of things I haven’t the time for: Testing the limits of L.L. Bean’s liberal return policy, trying to get the Queen of England to knight him, and convincing U.N. ambassadors to send him their photos with “Peace, Homey” written on them. Some actually do. This is a funny book. It has a monkey on the cover, and monkeys are funny – unless you’re Tom Tancredo, Mike Huckabee or Sam Brownback. It is Banterist policy to mention any books sent to us by publishers, provided they are humorous in nature and do not mention Ashlee Simpson or bird flu.